Cracked Pepper Dressing for the Pepper lover. For the love of home made salad dressings we have made a dressing that is tasty and easy to make. Knox's Cracked Pepper dry rub was created out of the love for choice cuts of meat and the earthy, spiciness of cracked black pepper. Now we have created a dressing recipe that makes salad just as delicious. 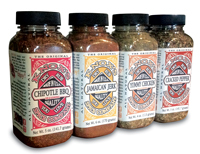 1 Tablespoon Knox's Cracked Pepper Dry Rub, maybe less depending on what you like. Mix together and chill. This light and slightly spicy dressing is excellent over salad or as a dip for vegetables.